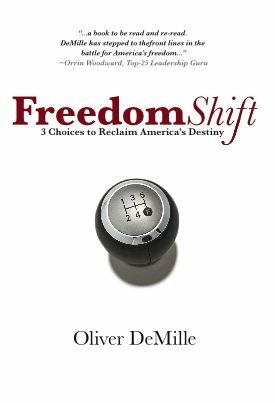 I just finished reading Freedom Shift by Oliver DeMille, and the book is fantastic! In this book, DeMille puts forth his 3 choices to reclaim our freedoms. Although written from the American perspective, the ideas he lays out can, and should, be applied to every country. We can have an entrepreneurial revolution, a rise of the independents, or developing and leading new tribes. We are not limited to one choice however, and should endeavor to choose all 3. DeMille starts off his book by going through the producer vs employee society, and explains how producers are more inclined to promote freedom than a society of dependents. Employees are dependents because everything they do or have is dependent on what their employer gives them, and so can’t truly do anything on their own. Public schools these days don’t really teach students to be leaders or entrepreneurs, and that is exactly what this world needs if we are to reclaim the freedoms that are constantly being taken away by our governments. Public schools teach people how to be employees, keeping the low and middle class citizens in the low and middle class. Our schools don’t teach us how to get out of those classes, as employees are not meant to. entrepreneurs work for their own dream, while employees work for someone else’s. What our schools teach is remembering names and date and formulas, with very little meaning being brought to any of it. For example, when I was in high school, I remember learning stuff about history, but what it was about those times that made it important. What I learned (when I could remember) were names and dates of different events and people, that was quickly lost after the tests were written. I had gained no understanding or meaning from those people or events. The book goes through the idea that what we need is a renaissance of entrepreneurship (building businesses) or intrapreneurship (acting like an entrepreneur within an established company). We need to start seeking individual education programs that prepare us to be producers rather than being dependent on employee-ship, and he gives some great examples of books to read. We need an entrepreneurial revolution! DeMille discusses the different types of producers needed for society to prosper. He identifies them as Gurus, Statesmen (not bureaucrats or politicians), Investors, entrepreneurs and intrapreneurs. It won’t be easy, especially with there being so many critics of success today. He gives a great example of how even the government is joining the critics. Even Washington likes to join the blame game by pointing fingers at Wall Street, Main Street and everyone in business, generating programs and regulations that they have no idea how to fund, assuming that the brilliant and long-suffering entrepreneur can do their heavy lifting for them and put all to rights. Today there are numerous obstacles to starting and growing small businesses. There will be many who justifiably mope that the current climate is not friendly to new enterprises. Frontiers have ever been thus, and our forebears plunged headlong into greater threats. What choice did they have? What choice do we have? What if they hadn’t? What if we don’t? There are plenty of good opportunities out there for those willing to look. I found mine with the LIFE business, which is where I was introduced to this book. DeMille then talks about the obstacles we face; how our nations have become complex and that jobs migrate to less difficult nations. He explains how in complex nations labor becomes more expensive, which starts a vicious cycle. …Many experts call this “progress”, but the natural result is that many companies respond by sending their operations and jobs to less costly nations. When this happens, complex nations react in an amazing way; they villainize the companies (“greedy profiteers”) rather than reducing taxes and regulations to entice companies back home. Then they take an incredible step: They increase taxes and regulations even more on the businesses that stayed! What is the result? More money flees and recession inevitably comes. Throughout his book, while explaining what freedom is, DeMille is explaining how freedoms are lost, what steps we can take to get them back, and how to avoid losing even more. There is a section where he describes ‘we the people’ as being a fourth branch of the government, where the people are the governments overseers. The constitution was written to protect the people, but that can only happen if the people remain informed. If the people aren’t paying attention to what the government is doing, there is really nothing to stop the government from ignoring the constitution. This is precisely what has gone on for the past 100 years, in ever-increasing magnitude. Part of this is due to the conveyor-belt education system we have which creates a culture of people who are only trying to fit in, that looks up to authority and that doesn’t question the status-quo. This allows the government to do what it will, with very few people even questioning its activities. What does it mean when China’s communist business environment is more inviting to U.S companies, more conductive to their growth, than the United States? When regulations and taxes in the U.S make doing business in China attractive? The U.S now ranks #40 out of forty industrialized nations in appeal to business. It’s almost as if the U.S. government doesn’t want business to succeed or grow, and only thinks that government spending and government jobs are the solutions to economic challenges. In a previous post, I have given a simple explanation about government spending showing why it is not a good solution. That article however really just shows how it is bad. This one shows why it won’t help at all. The simple explanation however, is that when the government spends money it does not truly increase spending, but only chooses where it goes. They have to get the money from someone else after all, who will no longer spend it on their own. One thing I’ve noticed a lot these days, is how there are two sides fighting an economic battle. The word ‘Socialism’ seems to pop up very often (I have even used the term my self) but we can’t accuse any party of being Socialist. DeMille explains in many ways throughout the book how we can’t consider either party socialist in nature. Socialism is about taking from the elites and giving to the masses, where both the Democrats and the Republicans are always taking from the masses and giving to the elites. This is aristocratic in nature, not socialist. This brings us to his section covering the rise of the independents, which gets very interesting. DeMille talks about the need for people to get away from supporting a party in particular, and instead supporting ideas and principles that matter. He mentions how the independents are on the rise, and no party can win an election these days without them. We need enough independent minded individuals that they either drastically change one of the current parties, or form a new party. We need independents who will stop listening and believing everything a party says and start examining the issues for themselves. There are still too many people who consider themselves either a Democrat or a Republican who will automatically support what one party says or does, while automatically dismissing anything that comes from the other party. Shortly after 9/11 the Bush administration and top senators from both parties reviewed the available intelligence and told the American people that Saddam Hussein had WMDs. Later, when the Democratic leaders turned on President Bush for following up on this intelligence, the American people blamed Republicans for the “lie”. But the Democratic leaders didn’t just claim that Bush had lied to them, they claimed to have reviewed the intelligence themselves. And, in fact, the Clinton Administration claimed that Iraq had WMD’s before Bush even ran for President. The problem is listening too much to either party. They both want to win elections, so they spin everything with the elections in mind. Studying both parties and other non-partisan views is vital for free citizens. Republicans should study both the governing and political factions of the Democratic party, not to find quotes to attack, but rather to find proposals worth supporting as well as those that need to be opposed. Democrats should do the same with Republican factions. Unfortunately, the party spoils system makes this unlikely. Which is exactly why independents are now the swing voters. The key action in all this, the thing which makes Keynesianism work, the lynch-pin of the whole model, is for the citizenry to do nothing but vote. Of course, they can live their lives, work at their jobs, send their kids to school and volunteer in their community. If they do these things, plus vote, they are good citizens. No more is asked, or wanted, from them. “Just shut up and vote,” is the subtle message from both parties. As long as citizens don’t study issues on their own, and leave them all to the ‘expert’ central planners, Keynesianism will continue to thrive. This is when people were most free, because the people governed themselves. The more central a government you get, the less they can work with individuals. The further away you get from the local level the more diverse are the cultures you have, with different needs and values. The rules and laws passed down from the central government might have been in one groups interest, but not others. A nation cares more about money and entertainment than about virtue or freedom. In such a model, “bread and circuses” distract the people from facing and solving their national challenges. Increasing taxes and regulations in your own nation while spending more and more to maintain your empire or power abroad. This has caused the downfall of many great nations in history. What really matters when it comes to tribes, is how they are a group of people who come together for a common purpose. What we need to do to secure our freedoms is to open our minds to the lessons of traditional tribes, and apply them in leading new tribes. There are new tribes starting all over the place, and are often formed through the influence of leaders who draw people together. What we need are groups of leaders building new tribes, or developing existing tribes, who have the ideas of freedom as one of it’s core values. These leaders need to develop themselves to the point of being able to influence others to educate themselves, and to promote the ideas of freedom on their own. DeMille goes through 8 types of freedom, where without all of them, we are not truly free. He also goes on to describe how each party in the government promotes the freedoms it values, but usually at the expense of the others, if not outright attacking the others. The following is a list of the freedoms in question, which were listed in columns of either conservative or liberal values. I’ll let you decide where you think they fall under. Fighting each other over which column is the most important is misguided and dangerous. It has seldom brought anything but pain to our nation and it’s citizens. There is a shift coming. Whether it’s a freedom shift or a force shift remains to be seen, but the choice is in our hands. With what has been happening over the past couple decades it looks like it is leaning in the direction of force, but it is not too late to shift back in freedom’s direction. I strongly encourage everyone to read this book and do your part in promoting the ideas of freedom. Freedom is important. I’ve come across many people with different opinions on what it right when it comes to the ideas of freedom, but everyone still seems to agree that freedom is important. Let’s not lose it.